New tools are regularly being introduced in the world of fitness. Many making claims to improve flexibility and range of motion. The foam roller exercises have been around for many years, used by physical therapists in myofascial release and for exercises on an unstable surface to rehabilitate balance, proprioception, and core strength. 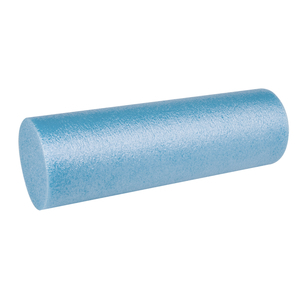 Physiologically we can explain the increase in range of motion after using the foam roller as a result of stimulation of the golgi tendon organ causing muscles to relax. In terms of physics we see that the direction of force applied easily increases the length of the structure being stretched and shearing forces exerted on the fascia can break adhesions. By stimulating blood flow it aids in circulation and vascular health. How can I use the foam roll? When should I use the foam roller? Foam roller exercises' effects on blood flow. A foam roll consists of a hard foam cylinder, usually about six inches in diameter and varying in length from 6 to 36 inches long. The foam should be firm enough that adequate pressure can be applied to the muscle, yet not so firm that bruising and soft tissue damage will occur. How can I use the foam roller? Massage or myofascial release. This is the application of force using the roll on a relaxed muscle. Enhancing a stretch. Using the roll to apply pressure when the muscle is stretched maximally. Using the roll as a pivot point and allowing gravity to assist in a stretch. Strengthening or movement based exercises using the foam roll as an unstable surface, similar to an exercise ball or BOSU to enhance balance, proprioception, and core muscle activation. Fascia is made up of layers of collagen fibres bundled in a parallel arrangement. Layers, separated by fat cells, are able to slide on each other. Each layer of fascia has collagen fibres that are oriented in a different direction. This arrangement increases its strength so that it can absorb forces exerted on it from different directions. Fascia transmits forces from muscles and reduces friction between moving muscles. Fascia also contains some elastic fibres that lend it elasticity. For more information on fascia click here..
Adhesions can form within and between fascial layers after trauma or periods of inflammation. Trigger points can form within the muscles resulting in pain and tension. Self myofascial release is simply the myofascial release techniques that one can do without aid of a professional. Click here for information on myofascial pain, and its management. The physiologist in me understands that the golgi tendon organ, responsive to changes in tension in the muscle and the rate of that tension change, will inhibit muscle spindle activity when it is stimulated. Simply said, we have neural receptors located at the junction of the muscles and tendons that can detect the change in tension in a muscle and the rate of that change. When that receptor is stimulated it causes a reflexive relaxation in that muscle. Using foam roller exercises assists in this allowing you to move a muscle into a greater length. For more information on the physiology click here. My inner physicist couldn't resist a simple model. To use the foam roll, or the stick, or finger, or any other method of applying a force to a muscle in a perpendicular direction the simple physics are as follows. We of course don't look at the heterogeneity of the tissues, internal friction, or viscoelasticity, but in terms of simple forces we can see that this method can give a little bit more "umph" to a stretch. III and exert a force on the centre of it so as to displace it by 2 cm while the two ends remain fixed. The entire rope gets longer by a distance 2c. III This is the force diagram. Once movement is complete, F is equal to 2 beta and theta is the final angle of displacement. Therefore, in very simplistic terms we can see that very little force is required to create additional lengthening in an already lengthened muscle. The application of enough force to cause only 2 cm displacement of a 30 cm long hamstring will result in a lengthening of an additional 1.33 mm. This is assuming the ends of the muscle stay a constant distance apart, the angles of adjacent joints remain constant during the application of the force. The shorter the muscle, the greater the lengthening with 2 cm of displacement. This of course is a very difficult thing to do, but in theory helps explain some of the benefits of using a perpendicular force on a muscle to assist in lengthening it or at least helping it relax by the above mentioned physiological means. The foam roller exercises should not be performed in situations where there is is inflammation, pain, soft tissue damage, or other contraindications or precautions without consulting a physical therapist or physician. Don't use the foam roller for lengthening a muscle prior to a sporting event. Just as static stretching prior to an event requiring power can be detrimental to performance, aggressive foam roller stretching may also interfere with performance. Using the foam roll to the point of producing pain prior to an athletic event will produce pain that will have an inhibitory effect on muscles you need to perform optimally. After a heavy or new strengthening regime where there is resulting tissue damage because of overload causing inflammation and delayed onset muscle soreness, I wouldn't advise performing foam roller exercises aggressively as it would likely just irritate recovering muscles. Using the foam roller gently to massage the muscles and stimulate circulation you would think might enhance muscle activity. A study published in April 2013 in the Journal of Strength and Conditioning Research found that amongst 26 college aged men and women of average weight, 30 seconds of foam rolling had no effect on performance. (2) Performance was measured as vertical jump height, power, isometric strength, and agility. As you can see there is little in the way of standardized guidelines with research evidence to support it's use, when, how, and with how much pressure. Why and how you are using the foam roller will likely determine its effect on performance later. The effects of foam roller exercises on arterial stiffness and vascular endothelial function was studied using 10 healthy adults. (3) After a 30 minute foam rolling session involving all the major muscle groups of the thighs as well as the trapezius muscles, it was found that arterial stiffness was reduced and vascular endothelial function had improved. March 2013 Volume 27,3 p 812-821. 2. KC Healey, DL Hatfield, P Blanpied, LR Dorfman, D Riebe. The Effects of Self Myofascial Release with Foam Rolling on Performance. Journal of Strength & Conditioning Research. Post acceptance April 2013.